No OBD Connection Required ! “DRS” active parking assist lines ! Microwave Radar will work in rain, snow and even through mud ! 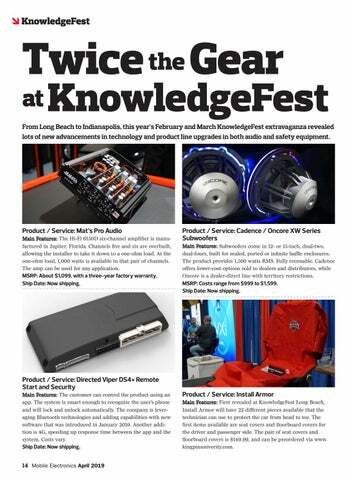 14// KnowledgeFest Show Coverage: Twice the Gear From Long Beach to Indianapolis, this year’s February and March KnowledgeFest extravaganza revealed lots of new advancements in technology and product line upgrades in both audio and safety equipment. 28// Real World Retail: Titan Motoring Titan Motoring started in the back of a van, and has since become a thriving business that continues to grow year after year. Keys to its evolution include open communication, team-building, cross-training and shared goals that aid in cultivating positive store culture. 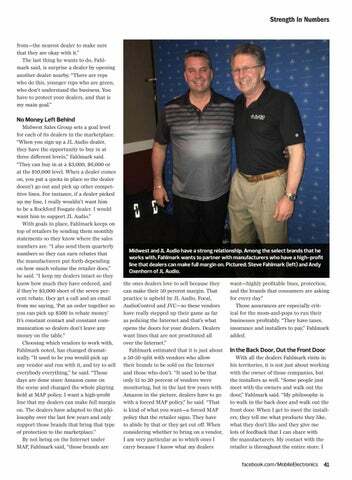 40// Difference Makers: Midwest Sales Group At the helm of his own company for more than 15 years, Steve Fahlmark has built solid relationships with dealers, vendors and installers to make his mark in the Midwest. 44// Strategy & Tactics: Selling With Confidence Learn how building confidence in yourself and your abilities will help you make clients more comfortable, and as a result, increase sales and dollar amounts in your business. 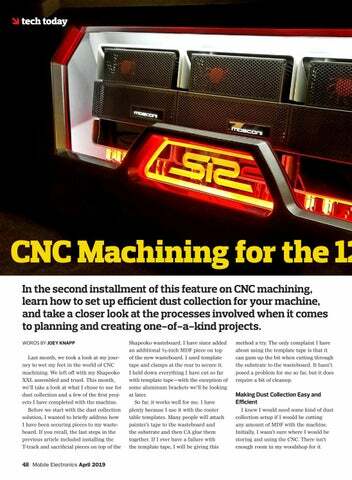 48// Tech Today: CNC Machining for the 12-Volt Industry, Part 2 In the second installment of this feature on CNC machining, learn how to set up efficient dust collection for your machine, and take a closer look at the processes involved when it comes to planning and creating one-of-a-kind projects. 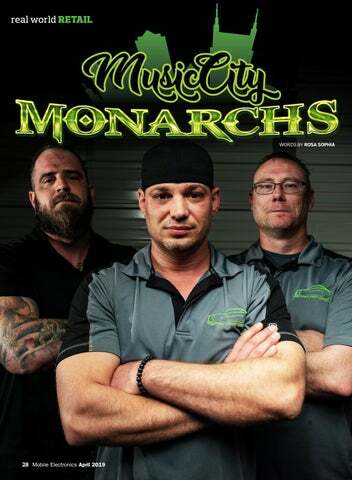 On the Cover COVER DESIGN: Manny DeJesus In 2018, Titan Motoring won an award for Best Store Culture from Mobile Electronics magazine. The team continues to demonstrate their commitment to nurturing a positive store culture, and building a workplace that all staff members are proud to be a part of. On this month’s cover, and in our Real World Retail feature, we salute their continued dedication to excellence. PUNCH THE NAME THAT STARTED IT ALL. you might be tempted to lay out every detail toward an objective. But you’ve heard the old saying that a battle plan never survives contact with the enemy, correct? It means there are always going to be outside influences that affect your plans. Weather or a sick employee might impact a sale. That’s probably the easiest example I can give you. But here’s one that’s even better: Accomplishing one goal might present a new opportunity that can change your plan altogether. Think about Facebook. If Mark and his boys had built in restrictions to make it only work in the way it was intended—to share pictures of college students across the country—it would have never evolved into the rich, diverse, worldwide sharing community it is today. Instead, they created the basic structure and let the users define what they wanted it to be. Take a tip from some of football’s best coaches: Script the first few goals, then maintain the ability to make adjustments as needed. Don’t allocate every minute of time and every resource toward an inflexible plan. Or, to use my personal saying: Always leave room in your objectives—and your life—for something good to happen. 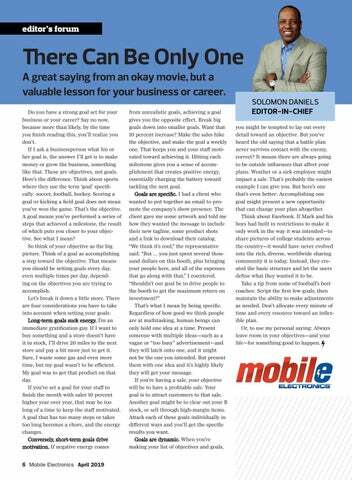 EDITORIAL Solomon Daniels Editor-in-Chief 978.645.6463 • solomond@mobile-electronics.com Rosa Sophia Managing Editor 978.645.6466 • rosas@mobile-electronics.com Creative Layout and Design: Manny DeJesus Contributing Editors: Jamie Sorcher, Joey Knapp and Laura Kemmerer. Roger McNamee was an early investor in Facebook who even mentored co-founder and CEO Mark Zuckerberg. With his new book, McNamee surprisingly declares that Facebook is ruining the world and has to be stopped. Having mentored many tech leaders in his career as an investor, McNamee says few things were more compelling than the early days with Zuckerberg. As he digs into the issues in this personal narrative, McNamee hooks up with others who share his concerns. Soon, he and a dream team of Silicon Valley technologists are trying raise consciousness about the harmful impact of Facebook on our public health and our political order. Simply put, it’s a tale of a business that isn’t bound by the normal constraints. Bill Campbell was known as “coach” for the way he advised and encouraged some of the brightest stars in the industry like Apple’s Steve Jobs and Google’s Larry Page. Campbell created lasting, yet informal, connections that were formative for the tech industry. But his nickname actually comes from his days at Columbia University where he coached the football team from 1974 to 1979. Working for Eastman Kodak when he was recruited to Silicon Valley in 1983 by Apple’s chief executive, Campbell was key to Apple’s turnaround when Steve Jobs returned to the company in 1997. Apple went on to revamp its Mac computer line and introduce the iPod, iPhone and iPad. While at Google, Campbell helped shape its leadership for more than a generation. Neither company would likely be where it is now without Coach Campbell. This book shares his principles, illustrating them with stories from people who worked with him. Use this as a blueprint to become a forward-thinking business leader, manager or store owner! Bikeshare is a basic idea with huge potential. There’s a supply of bikes around town, and anyone can take one and use it. When your ride is done, you return the bike to place you picked it up, and it’s ready for the next person to use. Limebike is $1 for every 30 minutes; $29.95 per month for 100 rides. Bikes are GPS-tracked so demand can be managed. Already available in 16 markets including Seattle; Dallas; Greensboro, N.C.; and Lake Tahoe, Lime is expanding to more cities and college campuses. Just download the Lime app; view the nearby scooters, e-bikes and pedal bikes; scan the QR code or enter number to unlock; and then lock up when done. Even if you cannot attend this annual car show, it’s worth it to check out the website and get a glimpse of what could be on the road in the future. I did see a flying car exhibit several years back—so who knows. An annual mecca for media and consumers alike, the show is one head-turning moment after another. Held from April 19-April 28 at the Javits Center in New York City, it features four floors of displays from the world’s automakers that showcase the newest vehicles and latest futuristic concept cars. Nearly 1,000 cars and trucks will be on display at North America’s first and largest-attended auto show dating back to 1900. TH K2 II A Coro TH K2 II A Coro is designed to transfer the precious musical message of the Thesis electronics with absolute fidelity, with the ambition to be absolutely transparent, leaving room only to the emotion evoked by the music. The search for the best acoustic result was based upon overcoming the intrinsic limits of traditional loudspeakers. Through a finite element simulation software (FEM) conceived by the Audison R&D team, a mathematical model was developed, which they used to create, with an intense prototyping activity, the ideal transducer. From Long Beach to Indianapolis, this year’s February and March KnowledgeFest extravaganza revealed lots of new advancements in technology and product line upgrades in both audio and safety equipment. Product / Service: Mat’s Pro Audio Main Features: The Hi-Fi 6150D six-channel amplifier is manufactured in Jupiter, Florida. Channels five and six are overbuilt, allowing the installer to take it down to a one-ohm load. At the one-ohm load, 1,000 watts is available in that pair of channels. The amp can be used for any application. MSRP: About $1,099, with a three-year factory warranty. Ship Date: Now shipping. Product / Service: Directed Viper DS4+ Remote Start and Security Main Features: The customer can control the product using an app. The system is smart enough to recognize the user’s phone and will lock and unlock automatically. The company is leveraging Bluetooth technologies and adding capabilities with new software that was introduced in January 2019. Another addition is 4G, speeding up response time between the app and the system. Costs vary. Ship Date: Now shipping. Product / Service: Cadence / Oncore XW Series Subwoofers Main Features: Subwoofers come in 12- or 15-inch, dual-two, dual-fours, built for sealed, ported or infinite baffle enclosures. The product provides 1,500 watts RMS. Fully reconable. Cadence offers lower-cost options sold to dealers and distributors, while Oncore is a dealer-direct line with territory restrictions. MSRP: Costs range from $999 to $1,599. Ship Date: Now shipping. Product / Service: Install Armor Main Features: First revealed at KnowledgeFest Long Beach, Install Armor will have 22 different pieces available that the technician can use to protect the car from head to toe. The first items available are seat covers and floorboard covers for the driver and passenger side. The pair of seat covers and floorboard covers is $149.99, and can be preordered via www. kingpinuniverity.com. Product / Service: JL Audio M6 Speaker Line Main Features: JL Audio’s M6 offers “transflective” LED lighting, using a cone that reflects light from beneath and on top. By attaching up to 32 LEDs, depending on the model, along the frame of the woofer, the cone will illuminate from beneath and shine through evenly without any hot spots. Full RGB available. MSRP: $430 to $650 Ship Date: Now shipping. Product / Service: Alpine Electronics KTA-450 Power Pack Amplifier Main Features: This amplifier can easily connect to the new iLX-W650 mechless seven-inch audio and video system. CarPlay, Android Auto, multi-touch swipe control with dual-camera input. This product won the Innovation Award at CES due to the power pack. Ship Date: Now shipping. Main Features: These dual 10.1-inch touchscreen monitors with built-in Android operating systems will cover any consumer’s tech level, and are preloaded with the Google Play Store, Netflix and Chrome. Hotspot or Wi-Fi capability will allow the user to share content between the monitors. VOXX Link allows those in the front seat to control the system without having to see the monitors. MSRP: $1,499 Ship Date: Now shipping. Main Features: VAIS Technology now offers a unit that is flash-programable to any application, with Sirius XM over USB. After hooking it up and plugging in the USB to the factory port, once downloaded, the unit will flash itself to the vehicle. Sirius XM will show up on the factory screen. MSRP: $339, with the tuner. Ship Date: Now shipping. Main Features: The DM-RTA is a one-box solution for specialty installers, offering an RTA, high resolution, an SPL meter, a polarity checker, a scope and a voltage meter in one chassis that interfaces with an app. The app can be used on Windows or Mac. A Bluetooth iPad option is also available. The cost is $649. Ship Date: Now shipping. Product / Service: K40 RL360DI With Laser Diffusers Main Features: The system is completely integrated into the vehicle, and all the customer sees after installation are two little LEDs. Two controller options are available. If the customer doesn’t want LEDs, K40 has partnered with Maestro RR and Kenwood JVC to offer a display on a radio screen. Coming out soon, K40 is partnering with Mid City Engineering to put data on the instrument cluster of newer Porches and Mercedes. Costs based on installation. Ship Date: Now shipping. Product / Service: Accele Electronics 360-Degree DVR Rearview Mirror Main Features: This touchscreen rearview mirror can record in 360 degrees, all around the vehicle, offering the driver multiple views. One camera at the bottom of the mirror records everything, omitting the need for multiple cameras. Ship Date: Now shipping. Product / Service: Cerwin Vega Mobile V Max Subwoofer Main Features: This affordable subwoofer gives customers a flexible, high quality product. Can be easily hooked up in the spare tire area and provides high-quality results with little effort. MSRP: Around $250 Ship Date: Now shipping. Product / Service: TFP LED Emblems Main Features: Grille overlays and LED grille lights allow the consumer to change the look of a vehicle inexpensively. The grille emblem comes in retail packaging, and replaces the OEM emblem. MSRP: Costs range from $99 to $199.95. Ship Date: Now shipping. Main Features: Punch amplifiers give consumers a range of options depending on the application, and each amp is equipped with Rockford’s propriety circuit called “Clean,” enabling the installer to gain-match the amplifier to a source unit. The circuitry of the amp allows the installer to set it up without the use of external devices such as a scope. A series of LEDs on the amp will let the installer know when it’s been set up properly. MSRP: $199 - $599 Ship Date: Now shipping. Product / Service: USA Spec BSM200 Radar Sensor Main Features: Multi-channel technology means the device is always monitoring, and it can detect other vehicles from any angle—front and back. The system knows when to alert the driver, and when not to. It’s easy to install and has an OBDII connection for accurate speed detection. Additionally, it is the only multi-channel OEM-like system on the market. Ship Date: Now shipping. Product / Service: Dynaudio Speaker Lines Main Features: Dynaudio offers three speaker lines from everyday use to competition-grade sound: Esotan, Esotec and Esotar. Available in two- and three-way component systems. MSRP: Prices range. Ship Date: Now shipping. Product / Service: Author Alarm IGLA Anti-Theft Device Main Features: Author Alarm made their first appearance in the U.S. at KnowledgeFest Long Beach, where they promoted the IGLA. This device uses standard circuit conduits in a door-locking mechanism and is both easy to install and conceal. Product / Service: Audison Line with TH 1.5 II Violino Softdome Tweeter Main Features: The user gets more accurate, natural sound with Audison’s line of products, including this tweeter with a 34 mm CCAW single layer voice coil and 38 mm silk dome. Ship Date: Now shipping. Product / Service: Kenwood eXcelon KFC-XP6902C Component Speakers Main Features: These speakers come as a set, providing solid mid-bass response, rich mids and high-frequency reproduction of sound. 300 watts of peak power and 100 watts of RMS power. Fits Chevy, Dodge, Toyota and more. MSRP: $219 Ship Date: Now shipping. Product / Service: Firstech Momento M6 Dash Cams Main Features: The Momento M6 introduces an application-based system. The user can review the information via phone and share it through social media. The M6 has the same offerings as the M5, with a two-channel set up and a two-year warranty, with a GPS antenna and a 32 GB SD card, but adds the new app and sharing capabilities. MSRP: $449.99 Ship Date: Now shipping. Product / Service: Morel Virtus Nano Speaker Main Features: The new Virtus Nano is a very shallow speaker system that will fit in any application. It has a mounting depth of only .67 inches. A component version is also available, in twoway and three-way. Designed for a shallow mount where space is an issue. MSRP: $650.00 - $850.00 Ship Date: Now shipping. SiriusXM subscription sold separately by SiriusXM. © 2018 Sirius XM Radio Inc. Sirius, XM and all related marks and logos are trademarks of Sirius XM Radio Inc. All other marks, channel names and logos are the property of their respective owners. All rights reserved. Product / Service: Linkswell T-Style Radios Product / Service: MSC America Main Features: MSC America celebrated their one-year anniversary after launching last year at KnowledgeFest. The company represents Audiotech Fischer for Brax, Helix and Match, as well as Blam speakers. This year they began representing Stinger high-end radar detectors. Main Features: With a focus on pickup trucks and SUVs, Linkswell continues to expand product lines. With these Android tablets, users can access Internet, Google, emails and more. Consumers can choose to add navigation, or just download apps in place of navigation software, such as Waze or Google Maps. MSRP: $1,095 Ship Date: Now shipping. Product / Service: Full Throttle Line of High Performance Batteries Main Features: Built for automotive applications, these batteries offer a high rate of discharge for car audio. There are about 38 different sizes, ranging in price, depending on the customer’s needs and the application. MSRP: $50 - $800 Ship Date: Now shipping. Product / Service: Eton RSR-80 Main Features: This new, small piece comes with multi-mount adapters for ease of installation and multiple applications. MSRP: TBD. Ship Date: TBD. Product / Service: Dynaliner Thermal Insulator Product / Service: Radenso Radar Main Features: Available for platinum dealers only, this product includes a five-year ticket guarantee and offers five laser jamming heads and radar. The product is easy to install. Costs vary. Ship Date: Now shipping. Main Features: This half-inch foam thermal insulator will cut down the heat in a vehicle to almost room temperature, keeping the car cooler to protect the interior, as well as electronic components. Available in three different thicknesses. MSRP: $69.00 to $109.00 Ship Date: Now shipping. Product / Service: Maxxsonics Hifonics Alpha Series of Class-D Amplifiers Main Features: The chassis and amplifiers are 25 percent smaller than conventional Hifonics amps, and more efficient. These are less conspicuous, and smaller so as to install in more confined spaces. MSRP: $199.00 to $599.00 Ship Date: Now shipping. Product / Service: SQL Audio Sound Mat / Sound Wave Rubberized Speaker Surround Main Features: This new brand from Certified Autosound was originally developed to service the installation needs of the company, and became a larger business. The brand debuted at KnowledgeFest Long Beach. The main focus is the company’s sound deadening product. Ship Date: TBD. Product / Service: JVC Kenwood, JVC KWM 650 BW Main Features: This is a JVC brand entry-level CarPlay model with a short chassis, designed for applications in which there isn’t enough depth. This touchscreen product offers all of JVC’s traditional features, plus 13-band EQ for users who may want to tweak the system for improved sound. MSRP: $399 Ship Date: Now shipping. Main Features: This line focuses on BMW upgrades including a tweeter that comes with a plug-and-play crossover system designed for late-model systems, along with an eight-inch subwoofer replacement. Requires few modifications. Ship Date: Now shipping. Product / Service: Rydeen BSS2 and BSS1LPB Allin-One Blind-Spot Detection Main Features: The BSS2 is a behind the bumper solution for blind spot detection. Radar sensors install behind the bumper. The BSS1LPB is an all-in-one solution that comes with a camera built into it. MSRP: $650 - $699 Ship Date: Now shipping. ALPINE ID SOUND COMBINED WITH HI-RES AUDIO The X-Series speakers, amps and subwoofers combine proven technologies, superior materials and innovative design to reproduce sound so accurately, you’ll feel like you’re right in front of the performance. The speakers and amps are Hi-Res Audio compatible to support a wide dynamic range. Product / Service: Brandmotion Radar Blind Spot Detection RDBS-1520 for F-150 Main Features: This product easily attaches to the rear bumper, offering truck-specific radar blind spot detection. The housing blends into the OEM bumper. MSRP: About $1,000.00 Ship Date: Now shipping. Product / Service: Crux RFM Camera Safety Integration Line Main Features: Newer cars offer camera safety, but Crux offers upgrades from those OEM systems. All integrated into one harness. The price point is about a tenth of what is offered at the dealership, providing huge savings. MSRP: $300.00 - $320.00 Ship Date: Now shipping. w Red Tail’s GPS tracking devices come with options such as selecting driving behaviors, and crash reports. MSRP: $100.00 - $150.00 for hardware, plus monthly or annual plans. Ship Date: Now shipping. Get directions, make calls, send and receive messages, and listen to music, all in a way that allows you to stay focused on the road. Just connect your iPhone or Android phone and go. www.sony.com ©2018 Sony Electronics, Inc. All rights reserved. Reproduction in whole or in part without written permission is prohibited. Sony and the Sony logos are trademarks of Sony Corporation. Android Auto works with devices using Android 5.0 software or higher. Some devices may not yet support Android Auto, see the Google site for the latest list of compatible devices. Android Auto and its logo are trademarks of Google Inc. Apple CarPlay works with iPhone 5 and newer phones. Apple CarPlay and its logo are trademarks of Apple Inc. Features and speciﬁcations are subject to change without notice. Product / Service: MB Quart Polaris RZR Audio Package Main Features: The powersports kit for 2014 to 2019 RZRs is plug and play and requires no modification to install the system. There are four speakers, eight-inch horn speakers and a ten-inch subwoofer, as well as a mechless powersports radio. 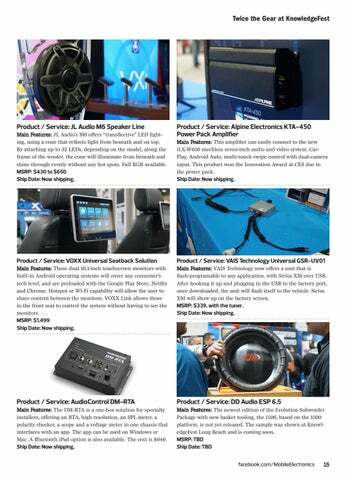 The radio kits or just the speaker kits can be purchased separately, as well. MSRP: $2,299.00 Ship Date: Now shipping. Product / Service: Harman Infinity All-in-One Mechless Waterproof Stereo Receiver Main Features: Offers the ability to control RGB speakers and accessory LED colors from the unit itself. The KAPPRV515 receives AM, FM, WB and RDS broadcasts, and is Sirius XM-ready. It has Bluetooth, USB and auxiliary inputs. Ship Date: Now shipping. Product / Service: Race Sport Lighting Terminator Series LED Headlight Kit Main Features: This kit comes with a two-year warranty, and fanless heat-sync technology. Easy to install. MSRP: Prices range from around $88 to $102. Ship Date: Now shipping. Product / Service: Focal Utopia M Speaker Drivers Main Features: The new M-profile cone combines rigidity, lightness and damping to make an ideal speaker driver. The line is offered with an a la carte concept, so the user can choose speaker drivers based on their own vehicle needs. Ship Date: Now shipping. Product / Service: DS18 Car Audio ATOM Amplifiers Main Features: Three models are available: two-channel, four-channel, and one-channel. Each amp has a fully built-in crossover, and can fit almost anywhere. A waterproof version is also available for powersports. MSRP: $99 to $185. Ship Date: Now shipping. Product / Service: Zapco HDSP-Z16 V Player and Built-In DSP Main Features: Zapcoâ&#x20AC;&#x2122;s flagship product is a DSP unit that offers 16 channelsâ&#x20AC;&#x201D;the first 16-channel processor available on the market. MSRP: $2,000.00 Ship Date: Now shipping. Main Features: These amplifiers come with or without a DSP built-in. The DSP offers full integration panel menus, with the new DSP Pro platform. MSRP: $600 - $1,300 Ship Date: Now shipping. Stewart Dailey discusses a project with a customer. Potential clients are offered different tiers of service once the salesperson learns the client’s budget and what they are hoping to find. notable,” Lindsley said. “We’ve increased [our staff, too,] since then. I think at Dallas, there were around 17 or 18 [of us, and now we’re at 23].” Store manager Donny Wolfe, shop manager Ray West and service manager Todd Perryman “provide constant training and improvement throughout the workday for employees,” Lindsley added. standards of Titan are maintained on every job, every time.” Though staff is cross-trained, the shop has a number of various specialties, including fabrication, vinyl wrapping, custom upholstery and detailing. “Titan has a full wood and fabrication shop with four routers, saw table, and fiberglass area,” Lindsley said. “We have a separate wrap room for wrapping panels with vinyl or carpet.” Additionally, technicians are expected to maintain their work areas and clean daily, according to Lindsley. “Techs are responsible for making sure their bays are stocked with installation supplies like screws, rivets, magnets and glue and when low, notifying a manager of their needs so they can be ordered.” The staff’s average tenure, Lindsley said, is just over three years. The shop also offers full health benefits and a 401K for employees, and pays for additional training. A conflict between the back and front of the store—installation versus sales— can be a common problem at many shops, according to Lindsley. At Titan Motoring, everyone is on equal footing, and he attributed this to the fact that much of the team knows what it’s like to be in the other person’s position. As a result, they can relate to each other more easily. Store manager Donny Wolfe handles job allocation, point of sale system maintenance, inventory management and sales. are also responsible for showroom cleanliness, organization, overall environment in the showroom, and following up with potential clients and past quotes, according to Lindsley. “We greet everyone enthusiastically and have a no pressure, informative dialogue about their goals for their project,” he added. Clients are also provided with a comfortable living room-style waiting area with phone charging docks, a television with Netflix and Hulu, coffee and water. Factory matched side mirror caps with blind-spot cameras and everything you need to install. Direct Fit, Factory Matching Side Mirror Caps Plug-n-Play Vehicle Specific Harnesses Blind Spot Integration Kits are available for select Ford, General Motors, Mercedes-Benz, and RAM vehicles. Employees are cross-trained, so it’s easy for them to move between departments. Because of experience in various roles, team members are able to better relate to each other—thereby increasing communication and minimizing difficulties. Pictured are Moe Goodell (left) and Ray West. or contact your local Wet Sounds Representive. Salespeople utilize a low-pressure sales approach focused on education to help clients reach an informed decision about their project. Pictured, Matt Park discusses options with a client. In 2018, Titan Motoring was named a Top 12 Retailer. Pictured is Miguel Vega, a fabricator and 12-volt technician who was named a Top 12 Installer the previous year. 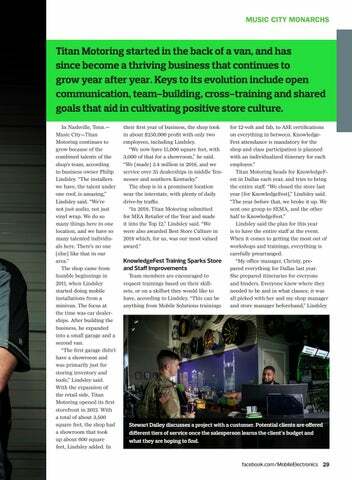 Despite having won the 2018 award for Best Store Culture from Mobile Electronics magazine, Lindsley said they hadn’t really had a plan to cultivate positive store culture—it just happened naturally. Taking part in team building activities outside of work, like having the whole staff go on a bowling trip, can help strengthen rapport, he said. About 20 percent of the business’s revenue is generated through lift kits, wheels and tires, suspension and the off-road category. Pictured is technician Tyler Perryman. “We got backed up last week, and I went in the bay and did some installing. I think [it’s important] for everyone to see that. We have managers who will take the trash out. We are all on equal footing and on the same level.” The same level of professionalism applies to all staff, who wear Titan Motoring t-shirts, black or gray pants and black or gray shoes, Lindsley said. “Generally, everyone is happy to be here, and that translates into our interactions with clients. I think [positive store culture] comes from the management— the top down. I was a tech for 18 years, and I know what it’s like to be in the bay.” This helps Lindsley relate to what other team members are experiencing. “That’s why we have heated and air-conditioned bays, and we have procedures for reordering things.” Because the Titan Motoring team is able to relate on this level, it’s easier to ensure there are processes and procedures and a positive environment to combat any issues, Lindsley added. “[We] promote that we’re on the same team, and [we’re] proactive [when it comes] to doing those things that alleviate the ‘us versus them’ mentality,” he said, adding, “That [mentality] is destructive to shop culture.” Showing employees how they’re appreciated through pay, trainings, team events and more has helped the staff of Titan Motoring become a cohesive, relatively harmonious team, Lindsley said, adding that “we build on each other’s strengths and help each other improve on weaknesses.” With things continuing to go so well, Lindsley anticipates eventually doubling the shop’s overall space, and increasing profits. “We’ll also purchase off-site property for larger projects and dealership work,” he added. 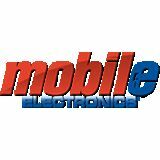 The premier conference and trade show for the mobile electronics industry. Dallas Convention Center August 9-11, 2019 60+ exhibitors showcasing the latest products 100+ educational workshops & vendor trainings 200+ hours of high-quality learning Talk one-on-one with the people you do business with - or should be! Network with peers and get hands-on training and advice from instructors who have shared your experiences. 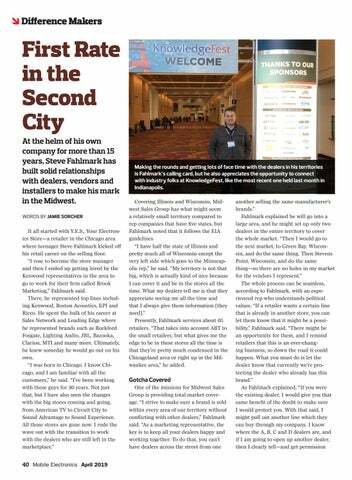 Making the rounds and getting lots of face time with the dealers in his territories is Fahlmark’s calling card, but he also appreciates the opportunity to connect with industry folks at KnowledgeFest, like the most recent one held last month in Indianapolis. Covering Illinois and Wisconsin, Midwest Sales Group has what might seem a relatively small territory compared to rep companies that have five states, but Fahlmark noted that it follows the EIA guidelines. “I have half the state of Illinois and pretty much all of Wisconsin except the very left side which goes to the Minneapolis rep,” he said. “My territory is not that big, which is actually kind of nice because I can cover it and be in the stores all the time. What my dealers tell me is that they appreciate seeing me all the time and that I always give them information [they need].” Presently, Fahlmark services about 65 retailers. “That takes into account ABT to the small retailers, but what gives me the edge to be in these stores all the time is that they’re pretty much condensed in the Chicagoland area or right up in the Milwaukee area,” he added. want—highly profitable lines, protection, and the brands that consumers are asking for every day.” Those assurances are especially critical for the mom-and-pops to run their businesses profitably. “They have taxes, insurance and installers to pay,” Fahlmark added. 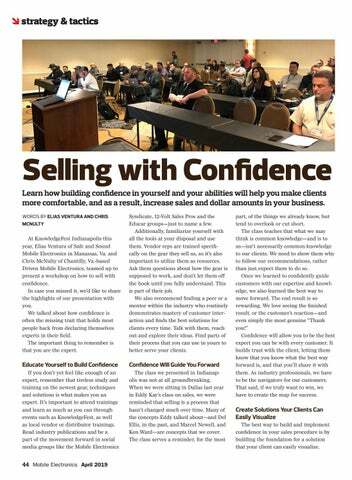 Selling with Confidence Learn how building confidence in yourself and your abilities will help you make clients more comfortable, and as a result, increase sales and dollar amounts in your business. 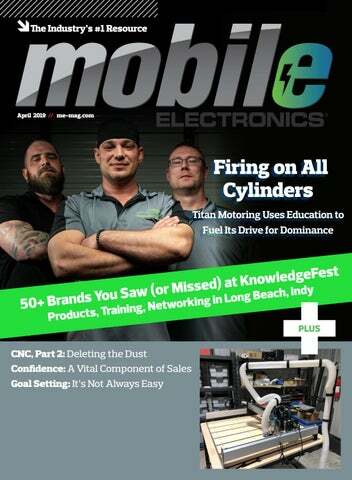 At KnowledgeFest Indianapolis this year, Elias Ventura of Safe and Sound Mobile Electronics in Manassas, Va. and Chris McNulty of Chantilly, Va.-based Driven Mobile Electronics, teamed up to present a workshop on how to sell with confidence. In case you missed it, we’d like to share the highlights of our presentation with you. We talked about how confidence is often the missing trait that holds most people back from declaring themselves experts in their field. The important thing to remember is that you are the expert. Syndicate, 12-Volt Sales Pros and the Educar groups—just to name a few. Additionally, familiarize yourself with all the tools at your disposal and use them. Vendor reps are trained specifically on the gear they sell us, so it’s also important to utilize them as resources. Ask them questions about how the gear is supposed to work, and don’t let them off the hook until you fully understand. This is part of their job. We also recommend finding a peer or a mentor within the industry who routinely demonstrates mastery of customer interaction and finds the best solutions for clients every time. Talk with them, reach out and explore their ideas. Find parts of their process that you can use in yours to better serve your clients. part, of the things we already know, but tend to overlook or cut short. The class teaches that what we may think is common knowledge—and is to us—isn’t necessarily common knowledge to our clients. We need to show them why to follow our recommendations, rather than just expect them to do so. Once we learned to confidently guide customers with our expertise and knowledge, we also learned the best way to move forward. The end result is so rewarding. We love seeing the finished result, or the customer’s reaction—and even simply the most genuine “Thank you!” Confidence will allow you to be the best expert you can be with every customer. It builds trust with the client, letting them know that you know what the best way forward is, and that you’ll share it with them. As industry professionals, we have to be the navigators for our customers. That said, if we truly want to win, we have to create the map for success. Create Solutions Your Clients Can Easily Visualize The best way to build and implement confidence in your sales procedure is by building the foundation for a solution that your client can easily visualize. If you don’t yet feel like enough of an expert, it’s important to make education a main focus. Attend manufacturer trainings, go to KnowledgeFest and ask lots of questions. Through continued education, you will build confidence, and this will translate to the sales floor. Pictured: Elias Ventura works with a client at Safe and Sound Mobile Electronics. your solution, furthering your position as an expert. If you have a comprehensive and authoritative knowledge of a particular area or skill, then you are an expert. We can begin the education process as soon as we have identified the client’s desired outcome. Teaching clients what they need to know will help them make the best buying decision for their situation. Show the Client You’re On Their Side Confidence will help you gain control from the outset. Building the confidence to lead the conversation will help you to become a better listener, understand the needs of your client and immediately have a solution in mind. it’s beyond what they initially were interested in. Confidence Will Lead to Increased Sales Use props in your presentation. Put products in their hands. Let them have an experience. Possession often leads to ownership. This is a great way to make the project feel more real to them. This is an experience they likely haven’t had elsewhere, nor will they if they choose to look beyond their trip to your facility. This is because you’ve demonstrated simply through your interactions with them why your shop is different. Now, your client will question everything they’ve already seen or will see in the future, based on the experience you gave them concerning their project. Closing the sale will become less of a chore the more you demonstrate confidence in your product, confidence in your abilities and confidence in yourself. Price objections will become less frequent. Through your confidence, you will have demonstrated why your shop is more expensive than the one down the street. You’ll find that by building confidence, and showing your clients that confidence, you will close more sales more quickly, often for higher amounts. You will begin to recognize relief in the eyes of your clients, instead of trepidation—making you feel better at the end of the day, with no clouds over your head. know it all, but because we care. Sometimes we all need a little reminder of how much we have to offer, in order to build confidence in what we do. If we can just remind everyone to instill confidence in each other and in ourselves, every day, then we can all make a difference. We want everyone to have more confidence. We, ourselves, have learned from individuals such as Ken Ward, John Schwartz, Jay Kent, Ata Ehdaivand, Rich Pietraszko, Justin Vallo and Jesse Mitchell, among others. 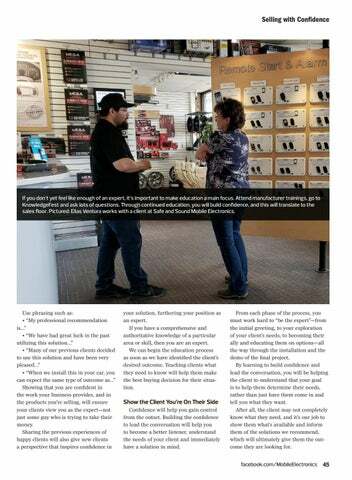 The positive influence of our industry peers will help boost your confidence in ways that will easily translate to the phone, on the sales floor or in the install bay. Surround yourself with mentors and industry friends you can learn from. method a try. The only complaint I have about using the template tape is that it can gum up the bit when cutting through the substrate to the wasteboard. It hasn’t posed a problem for me so far, but it does require a bit of cleanup.  tech today The Velcro straps are riveted to the arm and allow for easy adjustment of the hose, while holding it secure. To suspend the arm above the table, I used a piece of one-inch angle iron. The vertical supports for my table are a pretty thick steel, so I was comfortable that it could adequately support the weight of the riser and arm. The part I had the most trouble with was determining how I would facilitate the arm freely swinging. I wanted to make sure I didn’t put any additional strain on the belts, so the movement needed to be very smooth. Initially, I thought to use a medium-sized bearing and create a carrier and mount for the arm. It was a weekend evening in small-town Florida when I thought up this plan. My sources for parts were limited to big chain hardware stores or Harbor Freight. After striking out at the hardware store, I drove to Harbor Freight to see if I could find some bearings. I stumbled upon what I thought would be an even better solution than my bearing contraption—a wheeled castor with bearings for a smooth movement. Perfect! The castor I chose had a threaded stud for mounting and a U-shaped cradle for the wheel. The cradle was just right for supporting the aluminum angle stock. It only took a simple spacer and a bit of trimming to tailor it to my needs. To secure the arm to the vertical support, I welded two washers together and then welded them in the top corner of the angle iron. This gave me a sturdy support for the threaded stud of the castor. The caster was just the solution I needed for an easy pivot point. The remaining piece of the puzzle involved how to support the hose directly above the Suckit. I added an aluminum bracket with a Velcro strap. The bracket and strap allowed me to position the hose so there would be enough free space between it and the router moving in the Z axis. I am happy to report that the swinging arm has worked out great, and so far, I wouldn’t change a thing about it! The bracket replaced spacers that were between the Suckit plates and the Z axis assembly. Honda Civic Si Acrylic Trim The first car-related project I worked on was for a build at Simplicity in Sound. I made some trim pieces for the space behind the rear seat of a 2018 Honda Civic Si. I left an opening in the border of the trim that was proportionally sized for the SiS logo. Before I left California, I made a template of the size I would need to fit that spot and brought it home to Florida with me. The plan was to have the logo engraved into an acrylic window. The window would be bottom-lit to illuminate the engraving. While planning the project, Bing requested that I make an additional trim ring to border the window opening and help focus attention on the logo. The drag bit is one of the easiest bits I have used. The etching path gave the logo a dimensional look. The white and red lighting looked great! The cut pieces were ready to be shipped out to Bing and Jesse at Simplicity in Sound. I started by taking a few measurements of the template and created the shape of the piece in the Vetric Vcarve software. I haven’t really mentioned Vcarve yet, so I will take a few moments to interrupt this Civic project explanation to do so. I started with the Shapeoko using the Carbide Create software, which is free with the machine. I had really good experiences with it. It’s easy enough to quickly begin designing simple things. I came to realize that I wanted a little more control and a few more features that Carbide Create didn’t offer. After reading up on a few Facebook groups, it seemed the natural progression was to move from Carbide Create to Vcarve. Vcarve was also very easy to pick up and offered a bit more flexibility in the design aspects as well as the toolpaths. Now that I had the template digitized, I added in the logo and a border. I thought I would cut the design as a very shallow pocket using an endmill, but I was concerned that the light would stop at the break and not uniformly illuminate the whole logo. To help provide a steadier lighting throughout the piece, I used a diamond drag bit to etch the logo into the acrylic. The drag bit was nice because I didn’t have to worry about feed rates, router speed or depth of cut. The tip on the bit is springloaded, so it just needs to be in contact with the substrate. The bit drags, so the router is not even powered on, and because it’s doing minimal work, the feed rate can be pretty high. The path the bit took when etching made the logo almost look 3D—an added bonus! Once I had the pieces ready to go, I shipped them back out to Bing for installation. The light evenly lit the entire logo and the piece fit the window perfectly. SPECIAL OFFER After sharing the first installment of this article with the folks at Carbide 3D (the Shapeoko company) they said they wanted to extend an offer to our readers. For the month of April, they are offering a $75 discount for anyone using the code SHAPEOKO75. This is a very generous offer; they normally do not offer any sort of discount other than the Black Friday sale. So, if you are on the fence about purchasing a Shapeoko CNC, let this be the little push you need. You will be glad you made the purchase! serve a functional purpose for people driving the cart. To control the subwoofers, we added an RBC-1 controller. This was a perfect opportunity for a CNC project! The space on the dash that the knob was to be installed in had a bit of extra room around it. I used that space to make a round trim out of aluminum. I added the words “subwoofer level” to the perimeter, and tied them together with a line. The words and line were cut with a 90-degree .5-inch v-bit. Once the piece had been cut, I filled the cut areas with epoxy tinted black. I waited for the epoxy to dry and then sanded and polished the piece. The result is a trick accent that can quickly and easily be reproduced. Florida Sheriffs Youth Ranches Signs I had been bugging my wife to give me a project so that I could show off my CNC acumen. She responded with a little more than I had planned on. My wife works for the Florida Sheriffs Youth Ranch, an incredible organizations that serves kids all over Florida. She wanted to replace the signs on the front gates of their main office. She had some 30-inch decals, but needed a way to attach them to the gate. After consulting with Darren Fettik of Audio Designs and Custom Graphics, I suggested using 3/8 acrylic for the signs. to the flutes of the cutter if I didnâ&#x20AC;&#x2122;t keep a stream of air on it. It was slow going, but I got them cut. I installed the signs and brackets using all stainless hardware to ensure it looked good in rain or shine. The Shapeoko XXL was just large enough to cut out the pieces I needed for this sign. I had a pretty bad time trying to cut the soft aluminum. I would recommend sticking with 6062. SILVERADO SUBMITTED BY: JEFF CANTRELL, JACKSON CAR AUDIO, JACKSON, TENN. The owner of this 2016 Chevrolet Silverado wanted a stereo system with an attitude to match the styling of his awesome truck. Luckily for the client, Jeff Cantrell and the crew at Jackson Car Audio were up to the task! Jeff and Alex Mendez took on the challenge of a complete audio system overhaul. From front to back, every aspect of the truck stereo system was upgraded. Laying the groundwork for the upcoming gear was the application of full sound proofing for the front and rear doors and also the roof and the floor. To make sure the amplifiers had plenty of current, the alternator was upgraded with an Ohio Generator 320 Amp model. While the alternator was being upgraded, Alex also bumped up the power and ground cables to 1/0 gauge. With the audio system infrastructure in place, it was time for some fun. The team upgraded the radio to an Alpine Restyle unit. The front and rear speakers were upgraded with Hertz components in the front and coaxials in the rear. Power was provided by JL Audio and Digital Designs. The centerpiece of this install is the subwoofer enclosure. Jeff built a trick underseat and console enclosure to house a single Digital Designs 9510 subwoofer. To supply the subwoofer with the necessary airspace, Jeff had to pull out all the stops. The enclosure was created in multiple pieces to maximize the space available in the back of the truck. The result was an upgrade that not only looked incredible, it sounded even better! This build, crafted entirely by Mike Sandoval, is a very rare type. It is not so much rare in the gear used, the techniques employed, or the materials selected. What makes this build rare is that it’s the personal car of a fabricator with a completed build! Mike wanted to build a car that not only sounded great, but would also showcase his fabrication talents. 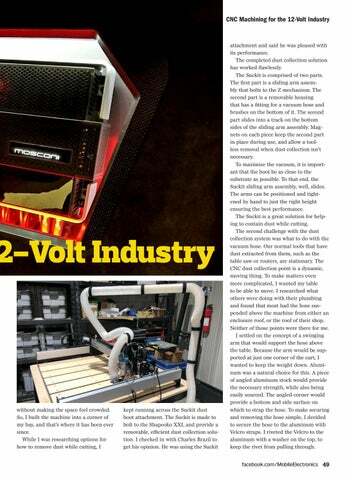 For the gear, Mike partnered with Rockford Fosgate and AudioControl. AudioControl handled the audio signals with their DM-810, while Rockford Fosgate provided the signal boosting with a 4-channel and mono Power series amplifier. The boosted audio signals were sent to T3 component speakers and a pair of T1 subwoofers. To make his car usable during the build process, he broke the installation down into simple steps that allowed him to only have certain parts of the car apart at a single time. This system let him keep the use of his car, and also helped avoid the dreaded “under construction forever” syndrome. Mike’s design of the trunk is reflective of his initial desires to provide unique protection for the subwoofers, showcase what he has learned over the years from Mobile Solutions, and also retain the ability to return his car to stock condition. By looking at the photos, you’ll see he nailed it. He used a variety of treatments to finish off the trim pieces. Vinyl, carpet, aluminum and acrylic were all used to create this great-looking trunk. Mike would like to thank the owners of Sound Warehouse, Dean and Jennie Magnesen, Bryan Schmitt and Rockford Fosgate for their help. Our Driving Force Is Audio More than 25 million vehicles on the road today are equipped with HARMAN premium audio systems and connected technologies, covering 35% of the world’s cars. If you want that same performance in your boat, Infinity by Harman Kappa is your answer. Detail, exquisite build quality, and beauty on the water. Infinity means endless….we like to think of it as a boating journey that you don’t want to end, a destination on the water for your heart, soul, and mind. Above. INF8135M marine titanium 8” three way speaker with built in perimeter RGB ring and center mount RGB lighting. 500 watts. Also available in 6 ½” coaxial and 10” passive subwoofer. To Learn More Visit: www.infinityspeakers.com Or Please contace: Shawn Spedding at 816-385-1944 / shawn.spedding@harman.com © 2018 HARMAN International Industries, Incorporated. All rights reserved. Infninity is a trademark of HARMAN International Industries, Incorporated, registered in the United States and/or other countries. Features, specifications and appearance are subject to change without notice. Consider offering your customers a dedicated area in your store where they can conduct product research, allowing them to feel comfortable discussing what they learn with you. We hear it every day: “I can get that cheaper on the Internet.” It’s as if the Internet has somehow become the trusted source for every purchase. Or, at the least, a sore spot for every brick and mortar retailer. There may be a way we can gain better control over the decision-making environment. When someone walks into your store, they are looking for advice from a trusted source. Building that trust requires some transparency. Offering a way for the customer to research the product under your watchful eye could provide some assurance that you’re the best source for trusted information. Your Customer Says, “Let me think about it.” It happens every day. The door opens, a potential customer-for-life walks in. You listen carefully to their inquiry, doing your best to understand both their needs and wants. Then you spend quality time presenting what you feel will best suit their desires. Or, in some cases, you take a moment to show a new customer the best you have before focusing on what they came in for. Regardless, by now you’ve formulated what you feel would best satisfy their ears, eyes and wallet. You ask for the sale and then the dreaded answer comes: “Let me think about it,” and they leave. We should all know what that means by now. They go home, phone a friend, head to your competitor or they look it up on the Internet. 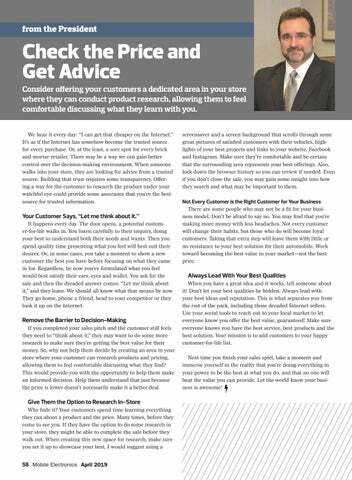 Remove the Barrier to Decision-Making If you completed your sales pitch and the customer still feels they need to “think about it,” they may want to do some more research to make sure they’re getting the best value for their money. So, why not help them decide by creating an area in your store where your customer can research products and pricing, allowing them to feel comfortable discussing what they find? This would provide you with the opportunity to help them make an informed decision. Help them understand that just because the price is lower doesn’t necessarily make it a better deal. screensaver and a screen background that scrolls through some great pictures of satisfied customers with their vehicles, highlights of your best projects and links to your website, Facebook and Instagram. Make sure they’re comfortable and be certain that the surrounding area represents your best offerings. Also, lock down the browser history so you can review if needed. Even if you don’t close the sale, you may gain some insight into how they search and what may be important to them. Not Every Customer is the Right Customer for Your Business There are some people who may not be a fit for your business model. Don’t be afraid to say no. You may find that you’re making more money with less headaches. Not every customer will change their habits, but those who do will become loyal customers. Taking that extra step will leave them with little or no resistance to your best solution for their automobile. Work toward becoming the best value in your market—not the best price. Always Lead With Your Best Qualities When you have a great idea and it works, tell someone about it! Don’t let your best qualities be hidden. Always lead with your best ideas and reputation. This is what separates you from the rest of the pack, including those dreaded Internet sellers. Use your social tools to reach out to your local market to let everyone know you offer the best value, guaranteed! Make sure everyone knows you have the best service, best products and the best solution. Your mission is to add customers to your happy customer-for-life list. Next time you finish your sales spiel, take a moment and immerse yourself in the reality that you’re doing everything in your power to be the best at what you do, and that no one will beat the value you can provide. Let the world know your business is awesome! VOXX takes BLIND SPOT DETECTION across to the rear, into reverse adding another level of Driver Safety and Awareness! In-Vehicle Entertainment has been reborn with the ďŹ rst system to deliver what todayâ&#x20AC;&#x2122;s consumers demand - TRUE UNLIMITED CONTENT CAPABILITIES. Download your favorite apps, connect your favorite devices, enjoy your DVD collection, but best of all, this system offers full control of the system without having to see the actual monitors. Apps developed for Android and Apple allow Mom and Dad in the front seat BLINDthe SPOT LICENSE PLATE BLIND to access and fully control system. No more pulling the car over or reaching around the seats. Innovation at its best! Consider offering your customers a dedicated area in your store where they can conduct product research, allowing them to feel comfortable discussing what they learn with you. In the second installment of this feature on CNC machining, learn how to set up efficient dust collection for your machine, and take a closer look at the processes involved when it comes to planning and creating one-of-a-kind projects. Learn how building confidence in yourself and your abilities will help you make clients more comfortable, and as a result, increase sales and dollar amounts in your business. At the helm of his own company for more than 15 years, Steve Fahlmark has built solid relationships with dealers, vendors and installers to make his mark in the Midwest. Titan Motoring started in the back of a van, and has since become a thriving business that continues to grow year after year. Keys to its evolution include open communication, team-building, cross-training and shared goals that aid in cultivating positive store culture. A great saying from an okay movie, but a valuable lesson for your business or career.